Not often do we reflect on where we are in life, as we're too busy going through it. When we're young, it's like, we are constantly one step ahead of ourselves. Maybe as adults too. For me personally, when I was in school, I couldn't wait to be in a career. When I was single, I couldn't wait to be married. When I rented a condo? Well, I couldn't wait to buy a home. But now, suddenly. Here I am - college graduate, married, home owner. All the years behind me gone to memories. All the years ahead, waiting to be revealed. And my present, up for grabs. Thinking back on it, I loved my childhood and I loved my days in school. Coming home at 3:00 and watching reruns of Saved By The Bell and Full House on the couch, or running outside playing sports with my teammates and friends was the bomb. I loved the freedom of being on my own, and knowing that my life is yet to be written. And I even loved that tiny, uncomplicated, one bedroom condo. So, why do we rush it away? Why don't we fully appreciate the exact place we are in? No matter how messy, or crazy, or even, how beautiful it is? All I know is, at one point or another in our lives, we'll cross that line of looking forward, to looking back. Looking back at a life rushed away, because we were too busy trying to get somewhere we thought would make us happier. Except, when we get there, are we happy? Happy exists, only if we allow it to exist. It's a thought; not necessarily some form of reality. It's not our situation; it's our thoughts. I think that's one of the hardest lessons in life. To be content, wherever you are. Even harder? To be happy wherever you are. Great post & perspective. Also, I love love love that sweater. I wish I could afford it!! I absolutely love your post. It's so true. We spend our entire lives looking forward to this and that and then what happens when all you left with is looking back? We totally need to appreciate where we are in life right now, to live in the present moment. That is hard to do as society is hardwired to always think about the future and the next thing and the next thing. Love your outfit by the way. Thank you for reminding me to stop looking to the future and to enjoy the present moment. Such a great way of thinking!! I agree with you on everything! A girl who can get serious while wearing sequined chevron and neon pink (and looking seriously hot doing it)? My fave :) great post, lady. That was so beautifully said. In the Bible Paul talks about how he had learned to be content in everything. I like how you talked about happiness is really about your thoughts. When my husband lost his very well paying job in '07 we were so unclear about our future financial situation but we were happy to be together. It didn't matter if we couldn't afford to buy the nice things we had before. All we needed was God, and each other. Those were some of the best times in our marriage. Through it all we have stuck out the "hard" times & we are far better off now than we were before. We just celebrated 10 years married. Thanks for such an inspiring post. Beautifully said, and a much needed reminder for the 23 year old me who's just waiting away for the future. It's time to embrace the Now. I couldn't have said it better. This applies to my life so much right now. Thank you for sharing such wise words. Certainly something I needed to be reminded of! I think it's very true what you wrote, trying to be happy with where we are in life--it certainly is difficult sometimes. Great outfit and great reminder to live in the present moment. Thank you for all the advice also for a new blogger : -) I love your blog ! So well said and written:)! You are wise beyond your years darlin:)! First- I love that lip color. Such a fresh look! Great post. Your honesty throughout is so relative towards us all. Love your outfit too! Sounds like this job is making you a more happy and grateful girl and that's lovely. You are so right -- I really needed someone to tell me this so thank you! I just graduated and am having the hardest time finding a job, after having a few dream jobs pass by me after doing everything I could do to get it. I need to learn to appreciate the here and now and be happy as I am. AND learn that things will fall into place. Loving this post, and this look! Gorgeous as always girlfriend!! Love your post!! It's so insightful!! I purchased the blue silk top from J Crew to wear with some printed skinnys and its just my luck that the top was on sale!! Loving how you paired it with the chevron and skirt! Lovely post! I am trying to live in the moment more often, after having PTSD for over a year, I realize how much I took for granted. Now I want to try to take advantage of everything life has to offer. You never know what lies ahead, good or bad, so be thankful for where you are! Great lesson. What a lovely post. I totally agree w/you. And your outfit and jewelry are beautiful too! This is one of my favorite looks of yours ever! I love all three of these pieces! The blythe blouse is my absolute favorite blouse, wear it all the time. Love your style, you are such an inspiration for my blog! Total cuteness! I LOVE these colors!!!! Great perspective! I think it's definitely important to try to live in the moment! I'm always planning for what's next; but, I definitely need to appreciate where I am now! 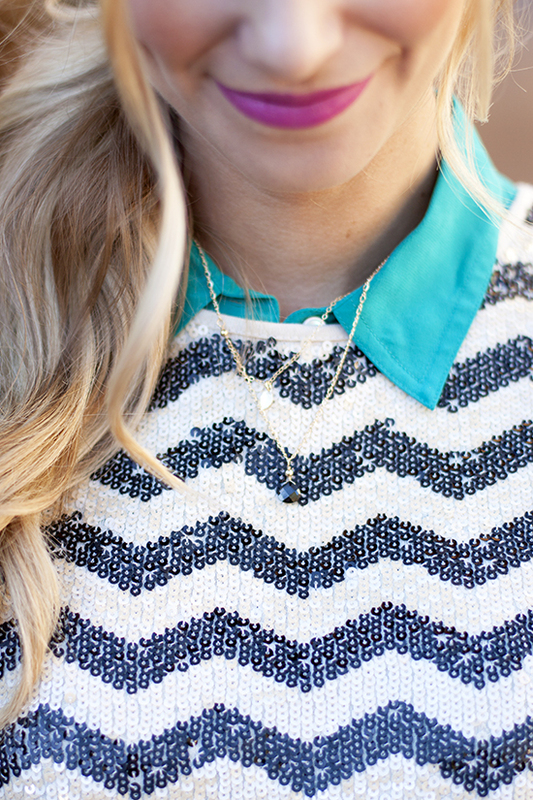 Loving your chevron sweater! You're so right, Katie. We define our own happiness! And one day, we will be looking back at all we have accomplished, and although there are many things I wish to achieve, the most important is to be happy! I like your necklace, so simple & cute! Well said and before you know it youve wished the best parts of life away! Here I sit having already had my children and looking back thinking I wish I could go back and start over! !...and now Im wishing I had that chevron top Ive been drooling over for weeks, lol! I love the colours of you outfit!!! Love the sequin J Crew top! Amazing! Love the layering and the booties too. You have great style, huge fan of your blog! Such an amazing post. Definitely going to be pondering this thought tonight. And of course, you look stunning my dear. your skit is brilliant! all is amazing! This is a great post and something to really think about. I'm about to achieve the final milestone in a young person's life (I count milestones as first boyfriend, graduation, first job, first home, engagement, marriage and now finally first baby) and it's kind of daunting to think that there are very few traditional milestones left for me (I can really only think of one: retirement!). It really is something that we have to come to terms with as expecting parents. That the milestones aren't for us anymore, but those of our unborn children. Totally agree with this setiment and it's one I'm always trying to reiterate to my kids. Choosing joy may not always be the easiest thing but it is SO much better when we do. what a great and inspiring post! I am having a hard time right now with accepting where I am in life right now (still living at home), but this really puts things in perspective! 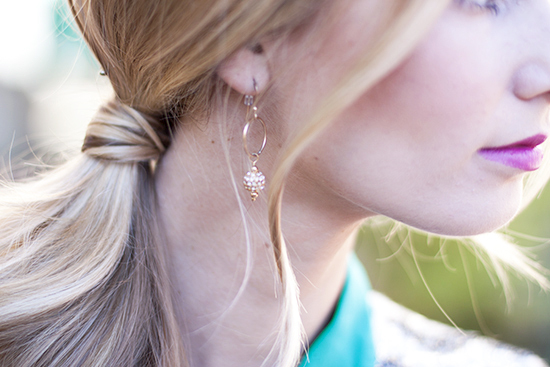 thanks so much for sharing - and the colors in this outfit post are so fabulous together! I have been following your blog for a couple months, but I'm not sure if I have commented before. This is an amazing post. You have put into words what I've been feeling all this year. Thank you! I love this post! It's so true and so spot on with where I am in my life right now. P.s. what lipstick are you wearing? I love it! I know that your blog is called running on happiness but its true. You really do exude so much happiness in all of your posts! Thank you for sharing your impeccable fashion taste and lovely personality all at once! Gorgeous sweater! and the colors are aaamazing. perfectly put together. Really enjoyed reading this... made me think. Thank you for that. I really love the outfit as well, the bright pink skirt is just beautiful! Wonderful post!! Thank you for sharing this much needed perspective. I could not agree more. I appreciate hearing this and being reminded of something I think we all struggle with in one way, shape, form, time or another. Thank you. I enjoy reading each and everyone of your posts. And, I would be remiss if I did not say how much I love the outfit! Love the mix of colors and the pop on your lips accenting the skirt. Lovely! Beautiful outfit. Dying over those JCrew pieces esp. the sweater! There is an old rap song that says: "back in the days when I was young I'm not a kit anymore, but some days, I sit and wish I was a kid again" I think we are always in a hurry to grow up and then when you are older you wish you could go back to those simple days of school, hanging with your friends and deciding what cute outfit to wear. Speaking of outfits, love what you are wearing. the vibrant colors are gorgeous and I love the preppy sweater. Such a great look. Along with a set of great outfit inspirations, the writing was also very meaningful! I think as we get older, we're less and less excited about things because we lose our drive. Everything becomes pretty routine and even work because mundane as well.. I think it's important to find something that will keep you looking forward and perhaps that's one of your purpose in life! Another great post, Katie! This is one of my greatest challenges. I'm a planner and I'm always thinking to the future often neglecting the very moment in front of me. Such a touching post. I think so many of us struggle with this. Thanks for being so honest and so relatable. Love your blog! Exactly what I needed to hear. it is SO easy to forget this simple idea. Very true words. To be content with ones situation is one thing, to be happy is another. I definitely know what it's like to keep wishing for more more more and not reflect on how much I already have! I have that skirt from Jcrew and it has come into play in my wardrobe more than I thought it would! Well said, lady. I always find myself wishing & waiting and I need to spend much more time simply enjoying! I adore this chevron top! So, so pretty! And that fuchsia skirt is such a stunning color! OMG! I have been thinking about the same thing lately. By the way i love your outfit. I love the outfit so bold and works so well. But more importantly the words. They are great and mean so much, thank you for sharing and they have got me thinking.